At DLF Public School, we measure success in terms of what our students do out of their lives, and in terms of their usefulness to others. The school, in year 2015-16, drove each of its Delfites towards a higher and greater good: the public interest. Many opportunities were given to the Delfites so that they can themselves exercise their power to bring change and better the world around them. 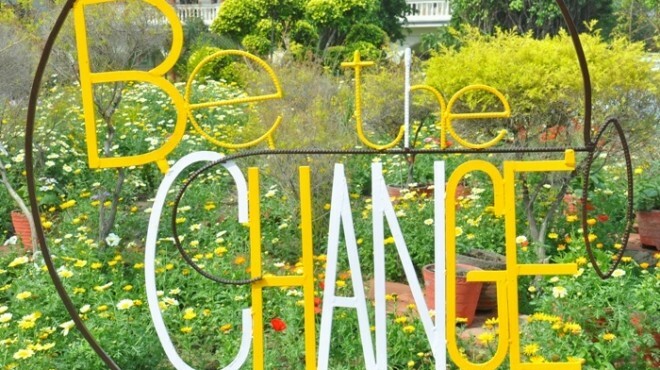 The theme ‘Be the Change’ cascaded down at each level through a series of thoughtful events and campaigns in the domains of Environment, Science, Social responsibility, and Technology engaging students into meaningful real life projects that can better the world. We endeavor to enable in every Delfite an awareness and appreciation of NOT ONLY their RIGHTS but their DUTY equally. ★ Delfites Take Water Campaign ‘Wait..Stop..Think.Before the Drop Shrinks!’ to Radhey Shyam Park Urge Residents to Save Water. 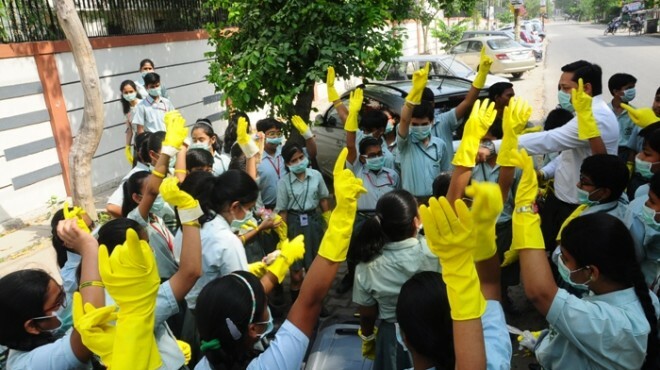 ★ Delfites Take Swachhta Abhiyaan and Water Conservation Initiative Beyond School Boundaries. ★ Water Saviours of DLF Raise Alarm on Water Scarcity At Gulmohar Greens. ★ This PTM Water Saviours of DLF Urge Parents to Save Water. ★ Delfites Urge Everyone to be Water-Wise this Independence Day. 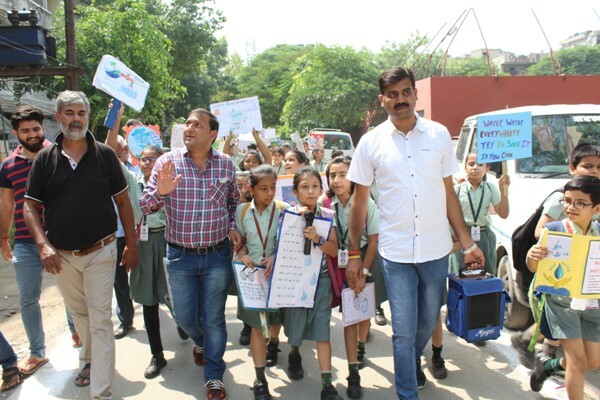 ★ DLF Public School Students Raise Public Alarm on Water Scarcity. Class IX, X, XII Delfites Sarthak Aggrawal, Shubham Gupta, Varun Gadodia, Ria Saxena and Utkarsh Kaushik inspired the young India as they developed first of its kind mobile app ‘Mission Talaash’- an app to search for the missing and lost individuals and launched it on Google Play Store in October 2015. ‘Recognition Day’- the unique annual celebration at our school was designed around the theme ‘Be the Change’. The young Delfites invited their parents to transcend their comfort zones and ‘Be the Change’! They challenged the parents to reflect upon the sensitive and critical issues like respecting our monuments, respecting women, and cleanliness. Delfites took on the roles as ‘Road Rangers’ taking charge of being responsible with road ethics and traffic rules. The social action campaign involved creating awareness on ‘Risky Vs responsible’ road behaviour amongst parents, teachers, students and community. The school collaborated with the Germany based Karcher-one of the leading companies in providing cleaning solutions to the world. It was India’s first of its kind, unique association between the two institutions who share the vision of a cleaner world! Delfites used innovative and high quality Karcher cleaning equipments and cleaned the Ram Manohar Lohiya Park, Rajinder Nagar Sahibabad. This drive was the outcome of the important message that the school is trying to imbibe in its students, “We have to make cleanliness our way of life” in consonance with PM Modi’s vision of a clean India. The school seeds in its Delfites an ability to see the holistic interconnectedness and correlation in society. And thus, Delfites expressed gratitude to the contribution of the very special stakeholders of the school, its support staff, by celebrating ‘Caregivers’ Day’, befittingly titled as ‘Aatmiyata Diwas-Ek Salaam Aapke Naam’ on March 31, 2015. Building compost pits and beautification of park. They also empowered the local children residents as ‘Park Rangers’ who are now taking charge of sustaining the beautification and neatness of the park along with our Delfites. Class VII Delfites exercised their power to actualize a change in their surroundings as part of Centre for Science and Environment’s Green School Project where every Delfite from classes 1-10 took charge as ‘EcoLavya- Saviours of the Eco system’ and kept a check on the injudicious use of natural resources within the school and the vicinity. Delfites are combating the environmental issues by becoming the ‘laboratory of actions’ and creating strategies through implementation of 4 Rs- Reduce, recycle, reuse and refuse. In built toilet for bedridden patients. Automatic shutters that open for excretion, Automatic sheet changing facility. The project is being funded by the National Research and Development Centre and Department of Science and Technology for further development of the design and has received huge appreciation by the acclaimed university professors, judges and even university students. Class X Delfites took charge as web rangers after they were inducted through an Inter-School Google Web Rangers session conducted at our school. 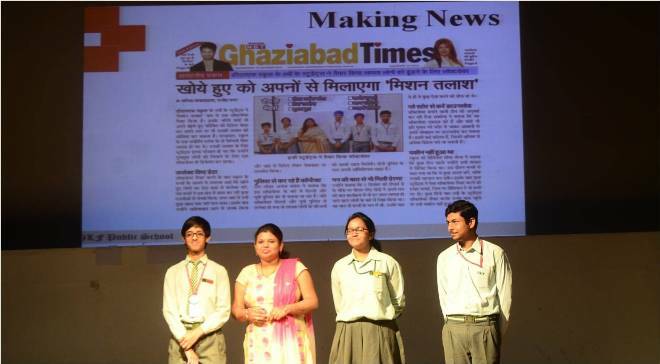 They are now cascading awareness on online safety amongst their peers across the school. Each of our class VII and VIII Delfites has already been empowered and the campaigns are successfully going on around the school. Student Social Responsibility: A Calling! Delfites of Community Club (Class VIII) made their Thursdays more meaningful by sharing their knowledge and resources with their friends at the Dhaulgiri Pathshala( Children of labour at Dhaulgiri Construction Site in school vicinity). Every Thursday, 10 Delfites visited these children throughout the year and engaged them in playful learning through activities as ‘role plays, storytelling and presentations’. All the 22 children, visited our school every Saturday, and enjoyed learning art & craft, music, skating, and computers under the warm guidance of teachers and students. Important part of our giving back to society! Taking at hand the dream of a clean India, Delfites have moved towards its realization with their hometown, and have adopted Sector-3 market of Sahibabad under their ‘Clean India’ mission. Delfites have been working with the natives and shopkeepers of this area and continuously carrying out the Cleanliness Drives. They are working towards issues like: Minimizing Water Logging, Plantation of Trees, Planting Garbage Boxes, Abolishing use of Plastic Bags, Educating People on Cleanliness and Hygiene and Regular Cleaning of the area. Great going Delfites, keep it up! Delfites marched for the cause of supporting the elderly on the UN Day for Older Persons. Delfites participated at the Annual Rally at India Gate on October 02, 2013. Adopted by heart, Delfites of Community Club (class VIII), are taking good care of children of Dholagiri Pathshala(children of labours of a construction site near school) by visiting their School every Thursday and spend quality time with them extending learning in a playful manner. Also, these children are warmly welcomed at the School and enjoy and avail of all the learning opportunities as available to Delfites. They are also guided formally by the school teachers and Delfites. The school also employed the beautiful concept of creating a WISH TREE this Christmas. Whatever our ‘Apney Bachche’ as well as students of Dholagiri Pathshala, wished from the Santa Tree, was adopted by our parents and teachers. Wishes got shaped into dolls, bicycles, colours, books, pencil boxes and toys. Delfites and their parents realized that they have the power to reach out and touch someone’s life and make the world a better place as they fulfilled the small desires and brought big joy to each of the children. We appreciate all those parents who are reinforcing in their children the important value of giving back to society. A priceless part of parenting indeed! “Apney Bachey” & Students of Dholagiri Paathshala learn the importance of well being at SPORTS MEET organized by Class VIII to mark the Culmination of Community Club for this session Ensuring Smiles for the Elderly! Delfites Saved on Crackers; Earned the Smiles of their Elderly Imbibed with a sensitized approach towards the older people and a desire to extend a warm support in the best possible way they can, Delfites gathered smiles for millions of other elderly through a large hearted care contribution made towards the Helpage India, an amount of Rs 3 lac 25 thousands, and made their Diwali special too. Theschool also organized a Free Health Check-up camp and an Awareness Talk for grandparents in association with Helpage India. Also, the school took a special initiative of providing the Helpage Advantage Cards for all the elderly living in Rajender Nagar area including the grandparents of students, teachers and support staff. DLPS was entrusted by the Ghaziabad Development Authority to carry a campaign to save River Hindon, Sahibabad, Ghaziabad. In line with their protest to save water bodies to conserve the environment and the future, Delfites cleared the weeds and garbage at the Bank of Hindon Barrage voicing their concerns through effective slogans and messages. Also, three Delfites of class X (Arish Mudra, Nivedita Tuli and Apoorva) conducted a Research that aimed at finding the status of micro-organisms in the water of Hindon and the anticipated decline in their population after increase in the influx of chemical wastes. The students of classes XI-XII as well as the teachers rode enthusiastically on the bicycles in Sector Rajender Nagar, Sahibabad on April 24, 2012. The message was quite clear – Use bicycle for short distances & save the environment. The earth warrior of DLPS made an attempt to change people’s mindsets for better! The students of classes XI-XII as well as the teachers rode enthusiastically on the bicycles in sector Rajender Nagar, Sahibabad on April 24, 2012. The message was quite clear – Use bicycle for short distances & save the environment. The unique rally was a part of DLPS endeavour to protect Mother Earth through numerous efforts made as a part of “Earth Month Celebrations” from April 04 – May 04, 2012. Distribution of Self-created mosquito repellents at a slum area. Delfites were handpicked by the Ghaziabad Development Authority to carry a campaign to save River Hindon, Sahibabad, Ghaziabad. In line with their protest to save water bodies in order to conserve the environment and the future, Delfites created a strong ‘Action Plan’ to be followed. They walked on to the Bank of Hindon Barrage voicing their concerns through effective slogans and messages. 35 children of class X participated in this social action project and cleaned the garbage as well as the weeds growing at the bank. Last year, our class V students adopted this neighbourhood in Sector II Rajendar Nagar; along the wall of the school to your right which was a dumping space for household garbage. After a series of meetings with the RWAs door-to-door visits to the homes & cleanliness drives they have been able to create a garbage disposal system through a network with the RWA, residents, local sweepers, the nagar nigam officials.Cleanliness that Changed People’s Attitude Delfites gave the Residents of Rajender Nagar a Clean and Green Neighbourhood After the cleanliness drive, Students of the school could see the changes not only in the surroundings but also in the minds of people. The residents were impressed by the efforts taken by the young souls and promised to make this effort worth by maintaining the cleanliness in their places. Delfites did a thorough survey of the market and identified various issues that needed everyone’s attention like flies-infested Water-logging, littering, Use of Plastic-bags, Lack of Plantation, Lack of Waste-bins, Unhealthy habits amongst people and more and interacted with the shopkeepers, people and children on the way highlighting the significance of cleanliness.Delfites distributed their hand-made Paper bags in exchange of the Plastic bags, planted Waste-bins and interacted with MCD workers. Every student in the school, in hands on manner, is made aware through various forums like debates, discussions, symposia, dramatics, and Video-Conferences. We are working on the ways to reduce use of earth resources, recycle maximum and reuse. The efforts have been made to reach out to the community and govt. Schools, to connecting to schools in other parts of the world through Video-conference sessions. Largely, we are working towards a healthier world. Children ingrain in them and those in the micro-environment an earth friendly attitude and habit which begins by saving electricity and water, to working on reducing the carbon footprints. Students are not only working on the projects on energy conservation but also generation of energy through our waste management project by the Science Department. The students have also made Earth Policies collectively and will be placing them at different locations at school. We believe, if the big change has to come, it can only come through small changes in the habits and the way we live. And, if we want to save ourselves, we MUST save the world! Nearly 1000 Delfites from DLPS joined hands with 24 million children across 94 countries of the world as they took part in the unique voting event for the children, Decade Global Vote 2011 for the WCPRC (World’s Children’s Prize for the Rights of Children). WCPRC is a social organisation that strengthens the voice of children connecting them through continents and countries. Delfites extended the DLPS’ mantle of social commitment as they exercised their vote in guest to demand respect for the children and protect their rights. The Students of the school of Community Club(Class VIII) along with 200 schools from across India got involved in one of the biggest paper recycling projects- The Grand Banyan Project, an initiative of the British Council in collaboration with the NGO, I Love My Mother Earth (ILMME) Foundation. 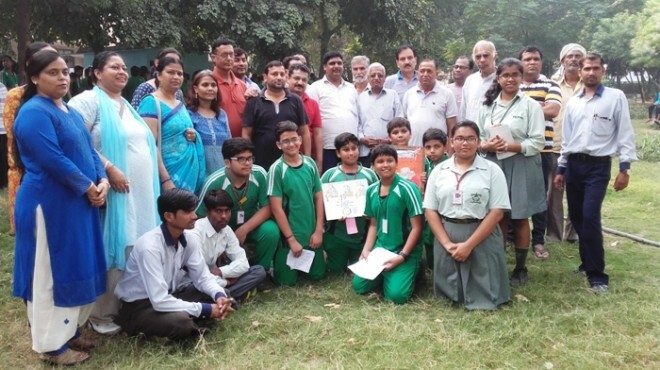 The project had two significant milestones – Collection of waste paper to produce notebooks for disadvantaged children and the other being- Cleanest Day Drive for which Students of the school adopted their School Neighbourhood area. The residents of Rajinder Nagar, Sahibabad witnessed a spectacle of social duty and responsibility by the very enthusiastic Delfites who may not be old enough to vote but did not deter from making an equally invaluable contribution to the society. The entire Pre-election campaign brought their Civics books alive and Students of the school encouraged the citizens to exercise their fundamental right- Right to vote. These young change agents said they would be delighted if they have been able to inspire even a few to vote. 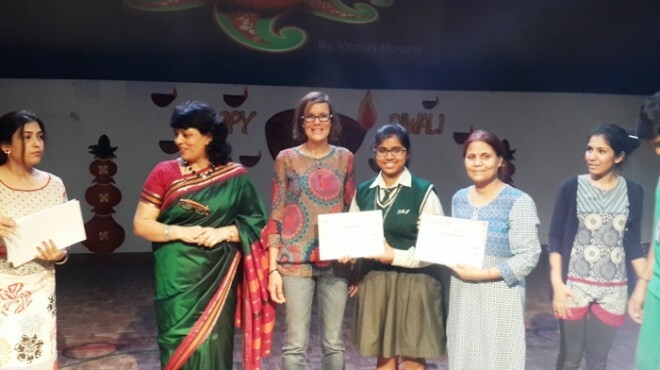 Students of the school also collect funds EVERY YEAR towards contribution for SOS and Helpage India alternatively. The school organizes free medical checkups of the underprivileged people from its doctors on panel. It also conducts free dental/eye checkup camps for them time to time. 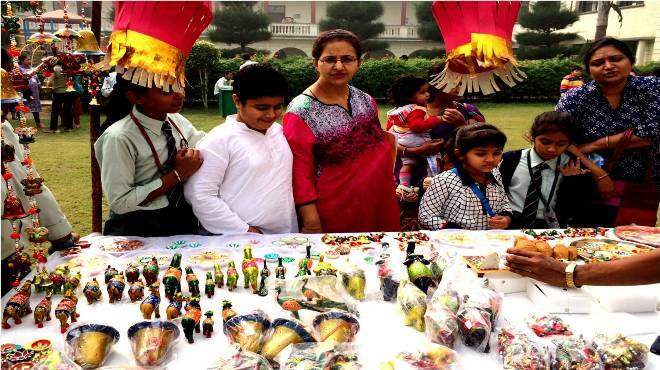 The school strives to contribute towards mankind by organizing numerous drives and campaigns to ban crackers. Global Warming is a serious concern. Keeping in mind the increasing pollution, students enthusiastically initiate every year, multipronged Signature Campaigns, Rallies and Marches, promising to stop burning crackers. Every year, they perform Street Plays and songs to encourage the localities to support the cause and save environment. Students of DLPS visited the site at Shalimar Gardens where the building collapsed to learn the cause and effect of the disaster. Later they had a brainstorming interaction with the engineers, who educated them on what should be the plan of action as a victim and an observer on disaster management too. The neurons developed through bookish knowledge were strengthened through practical reiteration. 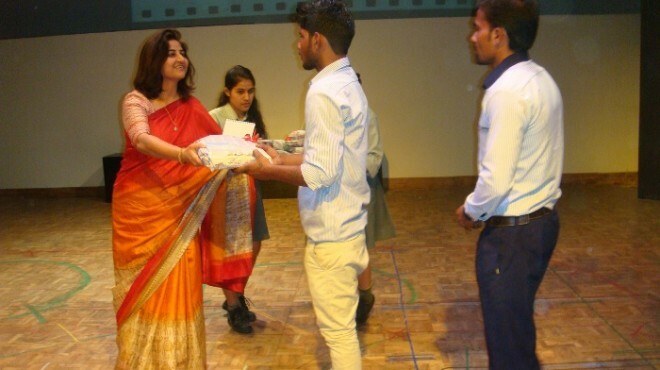 The visit crafted the second step in putting DLPS’s own baby –SSR (Students’ Social Responsibility) into action. The echo of Goonj, the social organization working towards the uplift of children is spread all over in the vicinity of DLPS as we believe that ‘Real generosity towards future lies in giving all to the present’. The School launched ‘Vastradan’, commemorating the ‘Joy of Giving Week’ from Sept 27- Oct 03, 10 where Delfites donated with open hearts. They contributed clothes, toys, cassettes, books, stationery and more. 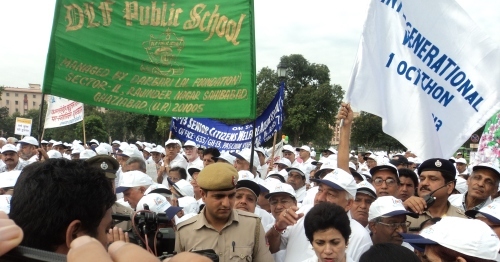 Delfites led Army Schools, Senior Citizens, in the ‘Run and Walkathon’, commemorating the World Food Day on Oct 16, 2009. Shiela Dixit, CM, Delhi flagged off the walkathon organised by CII (Confederation of Indian Industry) with the theme ‘India Prepares for the Commonwealth Games 2010′. The CM, Mrs. Shiela Dixit appreciated the young Yoga Champs of the school who portrayed some exquisite yoga postures. Delfites – Hearts with a soul, acted as catalysts in triggering a change of attitudes towards Organ donation as they joined thousands of school children, high profile doctors and experts in Donorthon-2010, a Walk for life on Saturday, April 03, a venture of Sir Ganga Ram Hospital, New Delhi. The two Km. walk stretched out to the nation through channels like NDTV 24X7, CNN-IBN, Delhi Aaj Tak and more. The significant attempt, we hope, would culminate in increase in number of organ Donors this year and thus will serve an important message to the world by young Delfites. When Disaster struck at 8.40 am on 26th January, 2001 in the form of Gujarat Earthquake, no one was prepared for the massive devastation and havoc that came in its wake. As the nation mobilized its resources under the guidance of our Prime Minister Sh. Atal Bihari Vajpayee, the students of DLPS were among the first to respond to the Prime Minister’s call to help the ravaged victims of the earthquake. In their determination to sacrifice for the needier, and sow hope where there is this despair, some students even decided to skip their birthday celebration and contribute an equal amount towards relief measures. Even the youngest child in the school was sensitive to the calamity and responded accordingly realizing that ‘We make a living by what we get, but we make life by what we give’. A cheque of Rs. One lac eleven thousand towards rehabilitation of Gujarat victims was handed over to the District Magistrate, Ghaziabad, Sh. Inderjeet Verma during a special assembly on the 28th February, 2001. Sh.Verma distributed the appreciatory momentos to acknowledge the sensitivity and thoughtfulness of the students in collecting such a massive amount. He lauded the efforts of the students while thanking them on behalf of the Chief Minister, U.P. and Ghaziabad Administration. 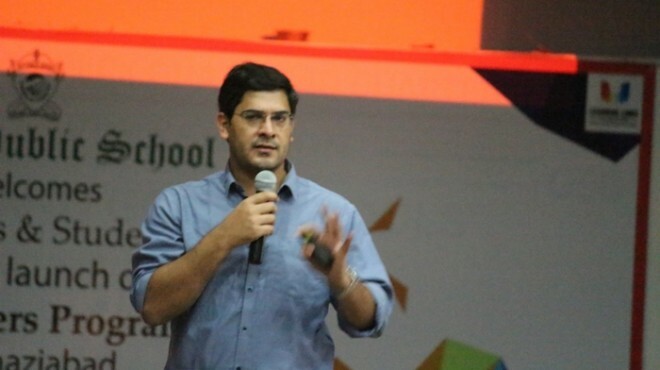 During his speech, he also appreciated the excellent value system and educational technology of DLPS, predicting that a school with such principles and foundation is sure to have a bright future. DLPS held a special assembly on February 25th, 2005 to express its support to the Tsunami Victims. The entire DLPS Family once again rose to the need of the nation which was grappling with the havoc and disaster left by the Tsunami. The united efforts of this family made it possible to collect an amount of Rs 1, 51,000/- as an aid towards relief and rehabilitation. The same was handed over to Mr. Deepak Agarwal, Chief Development Officer, Ghaziabad as a donation to the Prime Minister’s Relief Fund. Mr. Agarwal appreciated and acknowledged the efforts and cohesiveness of the DLPS Family towards this great cause. ‘Apney Bachche’ of Ram Raj Seva Sansthan Trust orphanage, enjoy the patronage of the school under APNEY Charitable Foundation, which has been working for past 6 years for education and health of marginalized children and adults. The school has opened its infrastructure and resources to these children. The foundation ensures that none of these children become dropouts. Many Children and adults have been benefited under the foundation programme. Over the years “Apney Bachche” have become active members of day to day school proceedings like assemblies, special functions and celebrations. Through Community and V4U club they are taught basic fundamentals like alphabets, numbers and handling computers. “The more you share, the more you care”, is an essential value impetus which is encouraged by sharing sweets with the less privileged children on each child’s birthday. Each child first says ‘thank you’ to God by giving as small a gift as a ‘pencil’ or whatever they wish to the ‘GOONJ BOXES’ kept in the School or to these children. Needy children are also adopted from the School neighbourhood. A child ‘Monu’ who was working as a ‘child labour’ was identified by the School children and brought to the School. he is now being taken care of and provided education by the school. DLPS and all its students patronize GOONJ (A Social Organization working towards the Welfare of Kids). Every student generously donates something for GOONJ on his/her Birthday. This club constructively channelizes the energy and potential of Class VIII students. Every Thursday, they go and spend ‘productive’ time in the community. They reach out to the invisible members of society—the elderly, the underprivileged and children with special learning disabilities. The students teach both children and adults, contribute to health promotion activities, and visit the homes of the less privileged. The objective is to change the perception of children being ‘helpless’ to seeing children as’ Drivers of Change’. Children take ACTIONS to change this world for BETTER. The children carry out projects like— converting waste dump outside their school into a garden, stopping child marriages etc. With students from Classes VI to XII, it functions on similar lines as does the Community Club. 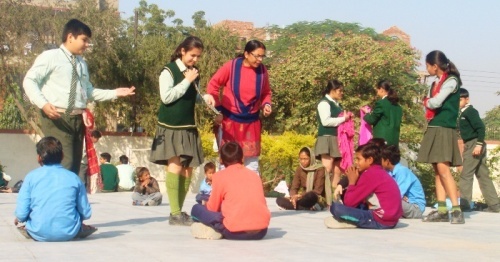 The students of class IX work closely with the community to carry out the Educational Programme—Each One Teach One. They have educated many children under this programme. Children are not only taught the three R’s but given Computer training in the school campus. It is also a part of students’ assessment wherein these children will be provided a Report Card after one year of completion of studies by the school students. The aim is to spread up the light of literacy to many. DLPS has initiated the “Interact Club”, which aims at triggering a keen sense of selfless service towards the society in the students. This club functions in association with the Rotary International, Sahibabad. The various initiatives of the club so far have been- Placements of trash bins in the school buses, launch of Cleanliness Drives including Cleanliness Walks in surrounding areas, extending help to those in need, visiting Blood Banks and more.